Status: Rare casual spring migrant east and central. Rare regular fall migrant statewide. Rare casual winter visitor east and central. Documentation: Photograph: 23 Aug 1986 Fontenelle Forest, Sarpy Co (Grenon 1990). Taxonomy: Four subspecies are recognized, two restricted to the West Indies, and one, florida, to central Florida; the remainder of the North American range is occupied by pinus (Pyle 1997). Nebraska birds are pinus. Pine Warblers apparently migrate in very low numbers through the Missouri Valley, sometimes very early in spring. There appear to be more reports in recent years. A report 9 May 1987 Sarpy Co was considered “Unaccepted” by the NOURC (Mollhoff 1989). Reports in fall are more widespread than in spring and are increasing in recent years; there have been fall reports eight of the last ten years 2008-2017. There are several photographs accessible on eBird, the earliest 2 Nov 2008 in Lancaster Co (eBird.org, accessed May 2018). There are later dates 7 Nov 2012 North Platte (Brogie 2013), and 23 Nov 2007 Wildcat Hills NC, Scotts Bluff Co; Dec dates are discussed under Winter (below). There are these Panhandle reports: a singing male remained in a pine grove at Oliver Reservoir, Kimball Co 29 Aug-13 Oct 1998 (Brogie 1999), single males were at Wildcat Hills NC, Scotts Bluff Co 11 (banded) and 29 Sep 2012 (Brogie 2013), one was in Greenwood Cemetery, Sidney, Cheyenne Co 19 Sep 2002, one was banded in Scotts Bluff Co 25 Sep 2008 (Brogie 2009), an immature female was in Scottsbluff, Scotts Bluff Co 4 Oct (year not given), and one probably this species was banded at Wildcat Hills NC 23 Nov 2007. Reports not accepted by the NOURC are 8 Aug 1989 Sarpy Co (Grenon 1990) and 12 Sep 1986 Douglas-Sarpy Cos (Mollhoff 1987). Winter: Pine Warbler has a propensity to appear at feeders late in fall. The only reports of over-wintering are of a male at a Bellevue feeder 18 Dec 2001-25 Mar 2002 (Brogie 2003), and another adult male videographed at a Doniphan, Hall Co feeder 28 Nov 2002-3 Feb 2003. Lingering birds were a single at a Fremont, Dodge Co feeder 4 Dec 2016 (Brogie 2017), two males near North Platte, Lincoln Co 7 Dec 2006, one at the feeding station at Fontenelle Forest, Sarpy Co 10-15 Dec 1984 (Cortelyou 1985, Williams 1985), another at a Bellevue suet feeder 14-16 Dec 2000, one at a North Platte suet feeder 24 Dec 2007 (Brogie 2009), and an adult male at a Ceresco, Lancaster Co feeder 28 Nov 2002-5 Jan 2003 (Brogie 2004). 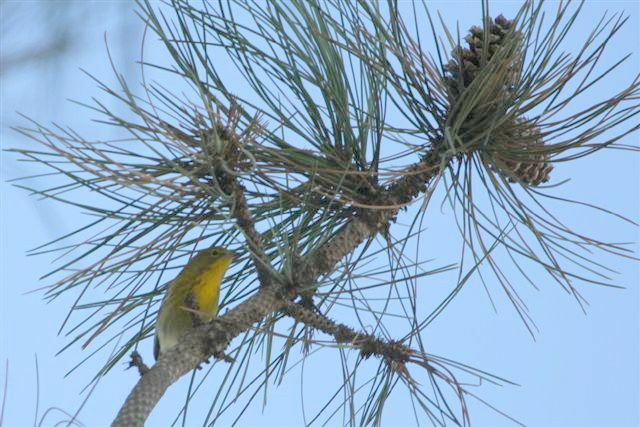 Photograph (top) of a Pine Warbler at Pioneers Park, Lancaster Co 1 Nov 2008 by Joel G. Jorgensen. Cortelyou, R.G. 1976. 1976 (Fifty-first) Spring Migration and Occurrence Report. NBR 44: 38-52.